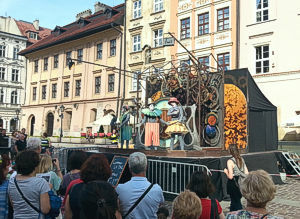 Krakow’s ULICA International Street Theatre Festival. Every year street theaters from Poland and abroad arrive to Krakow in early July to turn the city’s historic center into their playhouse. Their alfresco shows take place simultaneously in the Old Town’ squares – notably Rynek Glowny, Krakow’s vast central plaza – and sporadically in other areas of the city as well. Usually, strollers rambling in the Old Town may easily see up to ten different performances, from rather amateurish efforts to stunning professional gigs, on any single day from the afternoon through the late evening. The shows are free to watch and seldom require any language skills as the street thespians rely heavily on pantomime, masks, dancing, and circus stunts while possibly avoiding articulate speech. The International Street Theatre Festival, its original Polish name “Miedzynarodowy Festiwal Teatrow Ulicznych ULICA”, has been organized in Krakow every year since 1998. From 2017 on the organizers try to devote each edition to a single theme such as “Don Quichotte” in 2017, “Easterly Wind in 2018, and "Oh, what a circus!" in 2019. Krakow’s International Street Theatre Festival is a brainchild of Mr Jerzy Zon a local theater director. Organizers of the International Street Theatre Festival in Krakow. Mr Jerzy Zon has been the festival director from its beginnings. As he is also the manager of Tatr KTO, a municipality-funded company of players, the office of his theater conveniently doubles as the headquarter of Krakow’s International Street Theatre Festival. In 2019 32nd ULICA International Street Theatre Festival takes place July 4th through July 7th. Copyright © 2017, 2018, 2019 by MAREK STRZALA. All rights reserved.